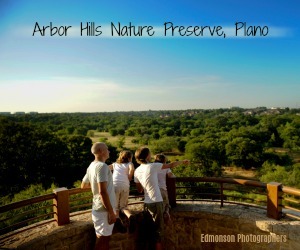 Where to go hiking or walking in the best open areas, parks, and trails in Collin County. Listed below are the large parks and open spaces where visitors may immerse themselves in a natural area or find a trail meandering through the park. Some of these parks may have playgrounds, but most will not. (For the best playgrounds in Collin County, visit here.) Many of these locations do not have restrooms; visit the website for further details. This large meadow is open to the public daily from dawn until dusk. This is a preserve, so please leave your pets and motorized vehicles at home. While there, explore the large trees on the Suncreek Trail. (Portable toilet on Meadow trail.) Free. Heavily-wooded 23-acre greenbelt runs along Watters Branch Creek and sits just about in the center of the Watters Branch Creek Trail (below). Free. Make your way through the labyrinth and stop at designated gardens that correspond to the Scriptural path Jesus made on His way to the cross. Fourteen various gardens (butterfly, rose, herbaceous, rock/cactus, evergreen, and seasonal annuals) make up the garden. This 40-acre park not only has hike and bike trails, but also a fishing pier, ponds, playground, and the Joe Farmer Recreation Center. Free. This 104-acre park has a 1.5-mile perimeter trail that briefly runs through a heavily wooded area and past a pond. But we guarantee this will be the kids' favorite park, as it features not only wide-open areas, but an ginormous playground and sprayground. Free. Allen offers more than sixty miles of trails, the longest Cottonwood Creek Trail (over five miles) and Mustang Trail (over almost five miles). And, best yet, Cottonwood Creek Trail connects to Mustang Trail, which provides over ten miles of continuous trail. The north end of the trail is at the junction of Ridgeview Drive and Cottonwood Creek, running south under 75, through Allen Station Park to the Allen Senior Center. Walk the entire trail or park near the Star Creek subdivision for an easy walk on both sides of Cottonwood Creek. Free. There are three west/north ends to this trail that connect with the remainder of the trail. We've chosen the middle to map here, because it has a designated parking lot and makes a great mini-escape if you walk through the wooded path under the Sam Rayburn Tollway. Or follow the trail southeast for a couple of hours, ending at Watters Creek shopping center. Free. A 436-acre preserve features a 52-acre relic of the Blackland tall-grass prairie. Drink in the amazing views early settlers would have enjoyed. Open from sunrise to sundown. Located near Blue Ridge. This 63-acre park boasts a stocked fishing pond, loop walking trail, bike trail, spray ground, playground, and a connection to the Taychas Trail. Restroom facilities, picnic tables, and concessions also available. Free. A 26-acre park with a 5-acre fishing pond, a three quarter mile loop around the pond and a connection to over four miles of trails. A dog park with a splash pad for dogs (no splash pad for humans here), an outdoor amphitheater and year-round restrooms (closed during extremely cold weather). Free. This is the largest park in McKinney at 212 acres. It has seven miles of mountain bike trails as well as two Dero Bike Repair Stations for minor repairs and includes an air pump. Overnight camping, designated campfire sites, large open space, playgrounds, year-round restrooms (closed during extremely cold weather) Free. This 158-acre park includes a lake, hike and bike trails, a park for the radio-controlled airplane enthusiasts, demonstration gardens, a farm museum, farm museum (limited hours, free), outdoor exhibits of Texas' rural heritage, a crepe myrtle and rose garden, and classes (register, cost). What is missing is a playground, but this is a great place to bring the kids to run and explore, pack a picnic, or find a secluded place for a wedding proposal. The park is open for visitors when the office is open, typically 7:30am-4:30pm but the park may close without notice in the winter months if events are not scheduled. Restroom facilities located in the office or near any event. At 135 acres, this is one of the largest parks in McKinney and inlcudes 22-acre lake with a fishing pier and paddleboat rentals. There is a 1.2 mile trail that is lit for evening access. Playgrounds, horsehoe & volleyball courts, an 18-hole disk golf course, concession stand and year-round restrooms (closed during extremely cold weather) Free. You'll find 56 miles of hiking and biking trails in McKinney. Currently the longest trail in McKinney is the Wilson Creek Corridor. Planted in 2011, over 120 varieties of crape myrtles were planted--the largest collection in the world and the only location with all known varieties planted. Concrete trail meanders through the park. This trail, too, does not technically have a name but it winds through the Stonebridge Ranch development. Start out at Adriatica Village, a newly built community reminiscent of a European village. Click here for a current list of restaurants to quench your thirst after your walk. Year-round restrooms, except during extremely cold weather, are available at Gabe Nesbitt Park. Free. While this trail technically doesn't have a name, it is over 5 miles long and runs from Boyd High School on Hardin Blvd, north of Bonnie Wenk Park, to the Towne Lake Recreation Area. Year-round restrooms, except during extremely cold weather, are available at Bonnie Wenk Park, Al Ruschhaupt Park, Towne Lake, and Erwin Park. This 289-acre sanctuary's mission is "to bring nature and people together to discover, enjoy, experience, restore, and preserve our priceless environment." There are 6.5 miles of self-guided or interpreted nature trails in the sanctuary.Live snake, animal, and plant exhibits are always available, as well as a pioneer village (playhouse scale) for children. Other exhibits rotate. Admission. Combining all three in one 42-acre space, and about three miles of trails. Rest on the benches under the shade trees near the babbling brook at The Preserve. In adjacent Murphy Central Park is a sprayground, playground, amphitheatre, and restrooms. This 200-acre park features miles of trails through natural areas where the kids can cross streams, ride their bikes or play on the playground. An observation tower is in the center of the park. This is also a great park to practice orienteering. Free. This 800-acre park is Plano's largest park with 3.5 miles of concrete trails and 5 miles of soft surface trails located along Rowlett Creek. Open sunrise to sunset daily. Free. Home to the Go Ape Treetop Adventure (Cost). Kayaking available Dawn to Dusk (no cost if you own your own equipment). Kayak rentals available at specific times. Seventy miles of trails can be found in Plano, the longest cross-city trails the Bluebonnet Trail, Chisolm Trail, and the Preston Ridge Trail. These three trails intersect, which means you can travel for miles without ever finding yourself on a road. Follow the link for a full park and trail system map or individual trail maps. This east/west trail is over eight miles one way and one of the few places you can still find Texas Bluebonnets (when in bloom, typically mid-March thru April) in Plano. The trail follows a utility easement. Archgate Park, Carpenter Park, and Hoblitzelle Park provide year round restrooms. The east end of the Bluebonnet Trail connects through the City of Allen, then drops down into Oak Point Preserve and ending in Bob Woodruff Park. Free. This north/south trail is over six miles one way, located behind subdivisions and shopping centers. Carpenter Park sits at the center of the trail and provides a respite with restrooms (open year round), a concession stand, and playground. From here you could also pick up the Blue Bonnet Trail. Free. This park is a 75-acre hike and bike trail adjacent to Lake Lavon. The trail is closed when wet. Restrooms available. Richardson boasts over 40 miles of trails with a goal to connect them all. Only a small portion of these trails fall within Collin County. Two and a half of the seven miles of trails in Breckinridge Park run alongside Rowlett Creek. Playgrounds, picnic tables and restrooms available. Trails wind through a hardwood forest and over Spring Creek in this 51-acre preserve. Website does not indicate restroom facilities. This 25-mile equestrian and hiking trail is located near Lucas and Wylie. The trail runs along Lake Lavon. Follow the links for a map showing multiple trailheads. In 2011 a Regional Trails Master Plan was created to connect the various trail systems of municipalities within Collin County. The plan builds upon the Six Cities Trail Plan and the North Central Texas Council of Government's Regional Veloweb. This page is intended to be a significant roundup article of parks, trails, and open areas, highlighting some of the best places to check out. So tie up the laces on your favorite walking shoes and follow our guide to the trails, parks, natural areas, preserves, and nature centers in Collin County.